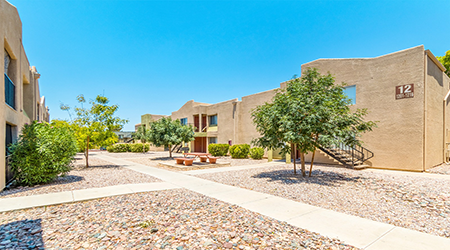 TUCSON, Arizona — ABI Multifamily is pleased to announce the $12.2 million ($42,361 Per Unit) sale of The Quails Apartments at 1120 E Irvington Road in Tucson, Arizona near the Tucson International Airport. The Quails is a 288-unit, two-story, garden-style apartment community, built in 1984 and 1985, which rests on approximately 8.37 acres. The property was built of frame and stucco, with flat and pitched roofs. The property boasts an attractive unit mix of (60) – Studio, (196) – one-bedroom and (32) – two-bedroom unit types, with a weighted average size of 534-square-feet. The area surrounding The Quails, located a few miles north of Tucson International Airport, has witnessed tremendous economic investment and job announcements over the last several years. Major job announcements include Raytheon (2,000 jobs), C3 Call Centers (1,100 jobs), as well as, the development and building of World View HQ’s SpacePort. The ABI Multifamily Team of Alon Shitzer, Senior Managing Partner; Lance Parsons, CCIM, Senior Vice President and Ryan Kippes, Vice President handled the transaction. The Buyer, Irvington Meadows, LLC was formed by a private investment firm based in Los Angeles, CA. The Seller, an entity formed through Alpha Wave Investors LLC, is a private investment company based in Laguna Hills, CA. For more information, Alon Shnitzer can be reached at 602.714.1283, Lance Parsons can be called at 520.265.1945, and Ryan Kippes is at 520.265.1895. Next articleVistancia Ranked Among Top Best-Selling Master Planned Communities in U.S.